The front of the blue card features a festive birthday cake design on the bottom right corner. Additional star-speckled flourishes decorate the corners of the card. A two-tiered, iced cake is on display in this red, white, and blue birthday card. 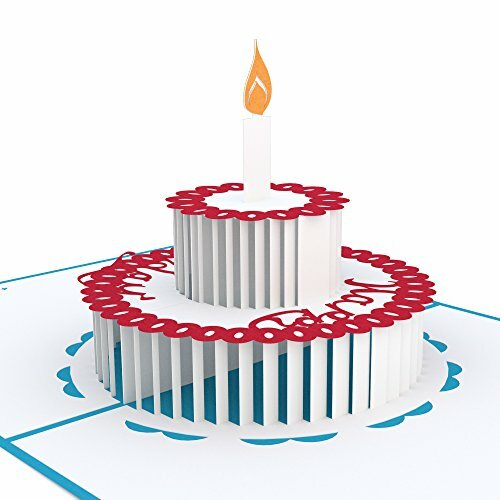 Open the card to reveal two layers of white "cake" outlined by decorative red icing swirls and a cursive "Happy Birthday" message that spans the bottom layer. A glowing golden candle tops this sweet treat. Young or old, a birthday card is the perfect chance to write something meaningful, inspiring, or funny. Wish your loved one many more years of happy surprises and new adventures and remind them that this is the type of cake they can enjoy every day. Size: This delicious cake card is 5 inches wide by 7 inches tall. Quantity: One Lovepop pop-up card with one blank envelope. Lovepop 3D, Pop Up, Birthday Cake Card. The front of the blue card features a festive birthday cake design on the bottom right corner. Additional star-speckled flourishes decorate the corners of the card. A two-tiered, iced cake is on display in this red, white, and blue birthday card. Open the card to reveal two layers of white "cake" outlined by decorative red icing swirls and a cursive "Happy Birthday" message that spans the bottom layer. A glowing golden candle tops this sweet treat. This delicious cake card is 5 inches wide by 7 inches tall. Includes one Lovepop pop-up card with one blank envelope.